Many food companies have pledged publicly to stop using bisphenol A-based epoxy coatings to line their metal food cans, because BPA is a synthetic estrogen that scientists have linked to breast cancer, reproductive damage, developmental problems, heart disease and other illnesses. The Environmental Working Group’s comprehensive survey of the American canned food marketplace has found that some food companies and brands – from small independent labels like Amy’s to global food giants like the Hain Celestial Group – offer BPA-free packaging in all product lines, but others, such as Target Corp. and Hormel Foods Corp. still use cans containing BPA. Disturbingly, consumers have no reliable way of knowing whether a canned food item is BPA-free. 31 brands - 12 percent of the brands in our sample – used BPA-free2 cans for all canned products. 34 brands, or 14 percent, used BPA-free cans for one or more of their canned products. 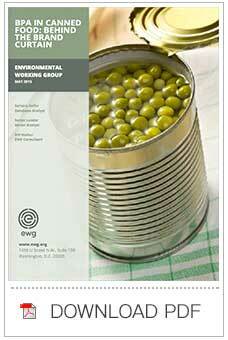 78 brands, or 31 percent, used BPA-lined cans for all products. About 46 percent of the brands in this group did not say whether they were working with can suppliers or packaging manufacturers to shift to BPA-free cans or to test substitutes. 43 percent of all brands gave ambiguous or incomplete answers to questions about their use of BPA and/or did not respond to EWG’s queries. Companies that said they had eliminated BPA or were in the process of doing so did not disclose the substitutes they were using, an omission that had the effect of slowing scientific study of the possible hazards of these substitute materials. Only 13 brands volunteered even a vague description of the alternative can coatings they use. In the absence of a clear national standard, companies can define “BPA-free” as they wish. As a result, some products labeled BPA-free may have some amount of the chemical in can linings. The U.S. canning industry is at a critical turning point. Strong and clear regulatory guidance and increased transparency and accessibility of information are sorely needed so that consumers can be assured that cans are truly BPA-free and that the alternatives being substituted for BPA-based epoxy are safe. The public cannot rely on current federal laws that regulate chemicals and food additives to ensure that BPA replacement chemicals are safer than BPA-based materials. The term “company” applies to an entity with control or influence over a brand’s use, or non-use, of BPA. The brand name and the company name are not always interchangeable. The “company” could also refer to the manufacturer, the distributor, the retailer, or any combination of these. The term “using BPA-free” is meant to indicate the company is either purchasing or manufacturing cans with no BPA added to the can lining. Companies can assure that cans are BPA-free but have less control over the food ingredients. For a more detailed explanation of the term, see Appendix A.